Letterpress printed broadside. 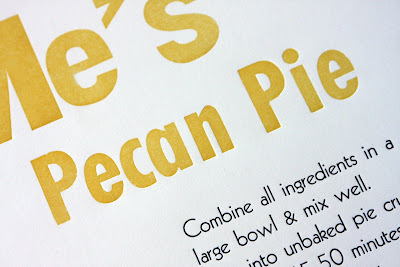 Printed on a Vandercook-4 from wood and metal type with a 4-color reduction linoleum cut. 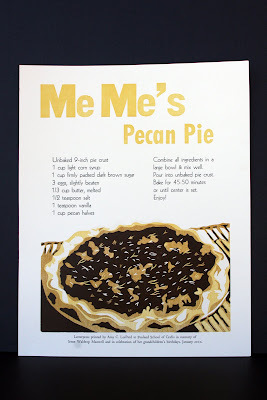 Irene Waldrop Maxwell's Pecan Pie recipe - printed in memory of Irene and in celebration of her grandchildren's birthdays. Printed by Amy C. LeePard during a letterpress printing residency at Penland School of Crafts in Penland, North Carolina during the winter of 2010. 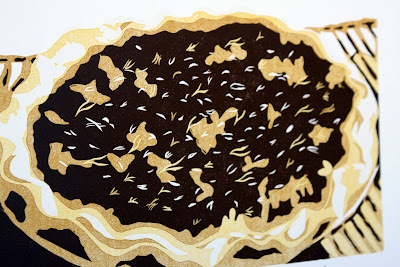 Special Edition of 5 printed on Strathmore Pastelle with deckle edge.